In scuba diving the equipment is your lifeline so it is therefore vital that you are kitted out well and understand the function and importance of your gear. Although scuba can be a very safe and enjoyable sport it is essential that you have the right equipment, and know how to use it. The basic equipment consists of items that the diver wears on their body – mask, wetsuit, fins, weight belt and BCD– and the device that enables them to breathe underwater – the regulator and cylinder. The diving mask creates an air space between your eyes and the water to allow you to see clearly and provide a window into the underwater world. A good quality mask will use scratchproof and shatterproof glass and be made from silicone to create a seal against the diver’s face. A demand valve delivers air to your mouth when you want to take a breath via the mouthpiece. A second mouthpiece – known as an octopus - is attached for your buddy to use an alternate air source in emergencies. With the aid of a hose, the regulator is attached to an air cylinder worn on the diver’s back. Also connected up to the air cylinder is the buoyancy control device – or BCD as it is most commonly known. This is an expandable bladder that helps you achieve neutral buoyancy underwater. It fits on your body like a jacket and allows you to control your buoyancy by adding and removing air. Straps on the back of the jacket hold the tank in position and have a quick release function to free yourself in times of emergency. To aid their descent and stop them rising to surface involuntarily, a diver will wear a weight belt around their waist. The belt can also be used to counteract the extra buoyancy created by certain items in the diver’s gear, such as their wetsuit. As well as telling you how much air you have left gauges are available which show your depth and can include a compass and temperature reading. A scuba diver must be fitted with a good quality wetsuit in order to keep the body warm and protect it from underwater hazards, such as jellyfish and sharp coral. It needs to be tightly fitted to your body so that it moves when you move. To aid its flexibility, wetsuits are typically made out of a soft synthetic rubber known as neoprene. This insulates the body by trapping a thin layer of water next to the skin, which the body then heats up. They are available in different thicknesses depending on the temperature of the water and a person’s individual sensitivity to cold. Wetsuits are only resistant to a certain level of coldness. If the water temperature is below approximately 15°C then the extra warmth offered by a dry suit is needed. These differ from wetsuits in that they are designed to stop water entering with the aid of seals at the neck and wrists. This means they typically provide better insulation and so keep their wearers warmer. Fins are worn on the feet to propel the diver through the water, and leave their arms free. These are available as either full-footed fins, or adjustable-strap fins, which are designed to be worn with boots when in colder waters. Diving equipment is very sophisticated and as such, very expensive. Buying a basic kit will set you back several hundred pounds at the very least. However, first time divers are not expected buy their own equipment straight away. 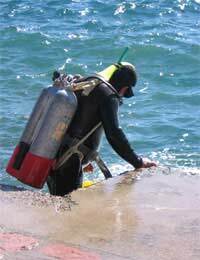 Typically only divers that have completed their training and then started to dive regularly decide to invest in their own gear. Good quality diving equipment is usually included in as part of the course fees. Diving centres also normally offer gear for hire. This is ideal because negates any worries about having to decide straight away which piece of kit is right for you. By the time you come to purchasing your own, you will likely have tried out different BCSs, runs and regulators, and know exactly what you want.